Reinhold Martin is Professor of Architecture at Columbia GSAPP, where he directs the Temple Hoyne Buell Center for the Study of American Architecture. He is a member of Columbia’s Institute for Comparative Literature and Society as well as the Committee on Global Thought. Martin is a founding co-editor of the journal Grey Room and has published widely on the history and theory of modern and contemporary architecture. He is the author of The Organizational Complex: Architecture, Media, and Corporate Space (MIT Press, 2003), and Utopia’s Ghost: Architecture and Postmodernism, Again (Minnesota, 2010), as well as the co-author, with Kadambari Baxi, of Multi-National City: Architectural Itineraries (Actar, 2007). In 2012, Martin co-curated with Barry Bergdoll “Foreclosed: Rehousing the American Dream,” at the Museum of Modern Art in New York, for which he and Bergdoll also co-edited the exhibition catalogue. His work centers on histories of space, power, and the aesthetic imagination, particularly as mediated by technical infrastructures. Related areas of research include architecture and epistemology, globalization and cities, and media history. Currently, Martin is working on two books: a history of the nineteenth century American university as a media complex, and a study of the contemporary city at the intersection of aesthetics and politics. 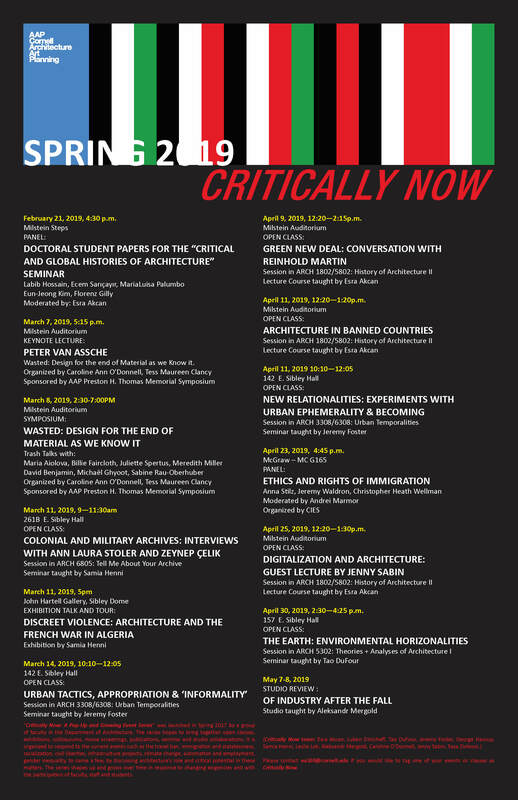 During the Open Class in History of Architecture II, Martin will talk about the Green New Deal and the “Power” website that was recently launched by the Buell Center under his directorship, which gathers work connecting infrastructure, politics and life. “History of Architecture II” overviews architects, buildings, movements and theories around the globe from the age of enlightenment till the present. Structured around major world historical events, and intellectual and technological leaps of human history, the course aims to give a multilayered sense of historical time and geographical space to the students, as well as to better equip them for a geopolitically conscious globalized architectural practice. Rather than a conventional survey with a linear western narrative or recent global histories that divide the world into a few self-contained and separate geographical entities, the course favors a more focused approach that relies on a critical and an intertwined understanding of architectural history around the globe. It helps students see a much more connected world, due to the people, ideas, objects, technologies, images, and information that travel around the globe and get translated in each location. In addition to the canonic interpretations, the course opens space for histories that are informed by critical, environmental, gender, postcolonial and critical race theories.